Wisconsin, one of the 50 United States of America, is located near the center of the North American continent and touches two of the five Great Lakes; Lake Superior and Lake Michigan. Its capital city is Madison, and its largest city is Milwaukee. Bordered by the states of Iowa, Minnesota, Michigan and Illinois, Wisconsin has been part of United States territory since the end of the American Revolution; the Wisconsin Territory (which included parts of other current states) was formed on July 3, 1836. Wisconsin ratified its constitution on March 13, 1848, and was admitted, with its current boundaries, to the Union on May 29, 1848, as the 30th state. The state's economy was originally based on farming (especially dairy), mining, and lumbering. In the twentieth century, many people living on farms began commuting to jobs elsewhere. Large-scale industrialization began in the late nineteenth century in the southeast of the state, with the city of Milwaukee as its center. Today, 42.6 percent of the population is of German ancestry, making Wisconsin one of the most German-American states in the United States. Numerous ethnic festivals are held throughout the state to celebrate its heritage. Its landscape, largely shaped by the Wisconsin glaciation of the last Ice age, makes the state popular for both tourism and many forms of outdoor recreation. Wisconsin is well-respected for its excellent public school system, and well-known for its colorful political history, including the well-known Senator Joe McCarthy, a controversial figure in 1950s America. The name Wisconsin may come from the Ojibwe word Miskwasiniing, meaning "Red-stone place," which was probably the name given to the Wisconsin River, and was recorded as Ouisconsin by the French and changed to its current form by the English. The modern Ojibwe name, however, is Wiishkoonsing or Wazhashkoonsing, meaning "muskrat-lodge place" or "little muskrat place." Other theories are that the name comes from words meaning "Gathering of the Waters" or "Great Rock." Wisconsin originally was applied to the Wisconsin River, and later to the area as a whole when Wisconsin became a territory. Begining of spring in Wisconsin. Wisconsin is bordered by Lake Superior and Michigan to the north; by Lake Michigan to the east; by Illinois to the south; and by Iowa and Minnesota to the west. The state's boundaries include the Mississippi River and St. Croix River in the west, and the Menominee River in the northeast. With its location between the Great Lakes and the Mississippi River, Wisconsin is home to a wide variety of geographical features. The state is divided into five distinct regions. In the north, the Lake Superior Lowland occupies a belt of land along Lake Superior. Just to the south, the Northern Highland has massive mixed hardwood and coniferous forests including the 1.5 million acre (6,070 km²) Chequamegon-Nicolet National Forest, as well as thousands of glacial lakes, and the state's highest point, Timms Hill at 1951 feet (595 meters). 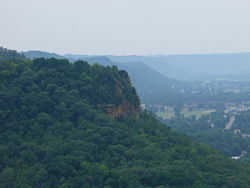 In the middle of the state, the Central Plain possesses some unique sandstone formations and gorges like the scenic Wisconsin Dells, in addition to rich farmland. The Eastern Ridges and Lowlands region in the southeast is home to many of Wisconsin's largest cities. 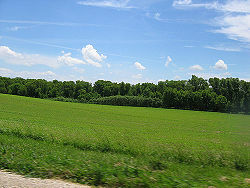 In the southwest, the Western Upland is a rugged landscape with a mix of forest and farmland, including many bluffs on the Mississippi River. This region is part of the Driftless Area, which also includes portions of Iowa, Illinois, and Minnesota. This area was not covered by glaciers during the most recent ice age, the Wisconsin Glaciation. Overall, 46 percent of Wisconsin's land area is covered by forest. The varied landscape of Wisconsin makes the state a popular vacation destination for outdoor recreation. Winter activities include skiing, ice fishing, and snowmobile derbies. Wisconsin has many lakes of varied size; in fact Wisconsin contains 11,188 square miles (28,977 sq km) of water, more than all but three other states (Alaska, Michigan & Florida). The distinctive Door Peninsula, which extends off the eastern coast of the state, contains one of the state's most beautiful tourist destinations, Door County. The area draws thousands of visitors yearly to its quaint villages, seasonal cherry picking, and ever-popular fish boils. Wisconsin's climate is great for growing crops, with a wet season falling in spring and summer, bringing with it almost two-thirds of yearly precipitation, averaging between 30 to 36 inches (760 - 914 mm) annually. It brings cold snowy winters. The highest temperature ever recorded in Wisconsin was 114°F (46 ºC) in the Wisconsin Dells, on July 13, 1936. The lowest temperature ever recorded in Wisconsin, –55°F (-48 ºC), was in Couderay, on both February 2 and 4, 1996. The first known inhabitants of what is now Wisconsin were the Paleo-Indians, who first arrived in the region in about 10,000 B.C.E. They used primitive weapons to hunt animals such as mammoths and mastodons. The Boaz mastodon, and the Clovis artifacts discovered in the city of Boaz, show that hunting was the primary occupation for these people. The Plano culture began to dominate Wisconsin around 7000 B.C.E., as the last glaciers retreated from the state. 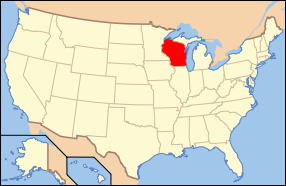 During the Archaic stage, from 6,000 – 1,000 B.C.E., Wisconsin was inhabited by the Boreal Archaic and the Old Copper Indians. People during this time lived in small groups or bands, and continued to depend on hunting for their existence. In the 1600s, Wisconsin was inhabited by Algonquian tribes, the Menominee and others. They were joined by Siouan tribes, including the Winnebago and Iowa. Later groups included the Potawatomi and Chippewa (Ojibwa). In 1634, Frenchman Jean Nicolet became Wisconsin's first European explorer, landing at Red Banks, near modern-day Green Bay in search of a passage to the Orient. The French controlled the area until it was ceded to the British in 1763 as a result of the French and Indian War. As white settlers became numerous in the area, a number of battles with the Native peoples occurred. The Winnebago War in the spring of 1826 and the Black Hawk War of 1832 are just two. 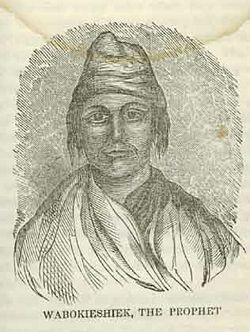 Yellow Thunder (Ho-chunk name Wahkanjahzeegah, born in 1774) was a chief of the Ho-Chunk Winnebago tribe. Historians state that he and his fellow chiefs were persuaded to sign their lands over to whites without realizing what they were doing. After signing over their lands, in what is now the area of Green Bay, the tribe was given eight months to leave. Yellow Thunder and other chiefs traveled to Washington, D.C. in 1837 to assert their claims, but President Andrew Jackson would not meet with them. Yellow Thunder and his people refused to move, and in 1840, troops arrived to force them to do so. Through a series of moves imposed by the U.S. government in the nineteenth century, all Native tribes in Wisconsin were moved to reservations in Wisconsin, as well as to Minnesota, South Dakota, Kansas, and Nebraska. Wisconsin was part of the Northwest Territory from 1788 to 1800. It was then governed as part of Indiana Territory (1800-1809), Illinois Territory (1809-1818), and Michigan Territory (1818-1836). Settlement began when the first two public land offices opened in 1834. Wisconsin Territory was organized on July 3, 1836, and it became the 30th state on May 29, 1848. The state mineral is galena, also known as lead sulfide, the foundation of Wisconsin's early mining history. Many town names, such as Mineral Point, reflect the period from the 1820s to the 1840s, when Wisconsin was an important mining state. When treaties with native tribes opened up southwest Wisconsin to settlement, thousands of miners—many of them immigrants from Cornwall, England—joined the "lead rush" to the area. At that time, Wisconsin produced more than half of the nation's lead; Belmont, in the lead region, was briefly the state capital. By the 1840s, the easily accessible deposits were worked out, and experienced miners were drawn away to the California Gold Rush. This period of mining before and during the early years of statehood led to the state's nickname, the "Badger State." Many miners and their families lived in the mines in which they worked until adequate above-ground shelters were built, and were thus compared to badgers. In the 1830-1860 period, large numbers of European Americans from New England and New York flocked to Wisconsin. New York was the leading dairy state in the US at the time; emigrants from there brought with them the skills needed for dairy farming, and butter and cheese production. Other New Englanders and New Yorkers settled in towns or cities where they set up businesses, factories, mills, banks, schools, libraries, colleges, and voluntary societies. They founded many Congregational, Presbyterian, and Methodist churches that still exist. 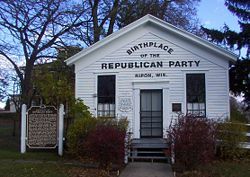 The immigrants formed the Republican Party in 1854—the first local meeting in the country was held in Ripon. They gave strong support to the Civil War effort, as well as to reforms such as abolition, women's suffrage, and especially, prohibition. Large numbers of Germans arrived leading, in a short time, to the state becoming over one-third German. Most became farmers; others moved to Milwaukee and smaller cities, setting up breweries and becoming craftsmen, machinists, and skilled workers who were in high demand as the state industrialized. The Germans were split along religious lines. Most Germans were Catholic or Lutheran, with some Lutherans forming the Wisconsin Synod and others joining the Missouri Synod. The Catholics and Lutherans created their own network of parochial schools, through grade eight. Smaller numbers of Germans were Methodists, Jews, or Freethinkers (especially intellectual refugees). Politically they tended toward the Democratic party, but 30-40 percent voted Republican. Whenever the Republicans seemed to support prohibition, the immigrant vote shifted toward the Democrats. When nativist Republicans, led by Governor William Hoard, passed the Bennett Law in 1889 banning instruction in the German language, German-Americans revolted and helped elect the Democrats in 1890. In World War I, German culture came under heavy attack in Wisconsin. Senator LaFollette became their protector and Germans strongly supported his wing of the Republican party after that. Scandinavians comprise the third largest ethnic block, with Norwegians, Danes, Swedes, and Finns becoming farmers and lumberjacks in the western and northern districts. A large Danish settlement in Racine was the only large urban presence. The great majority were Lutheran, of various synods. The Scandinavians supported Prohibition and voted Republican; in the early twentieth century they were the backbone of the LaFollette movement. Irish Catholics came to Milwaukee and Madison and smaller cities as railroad workers and quickly became prominent in local government and in the Democratic party. They wrestled with the German Catholics for control of the Catholic Church in the state. 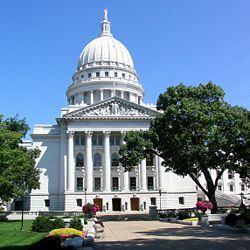 The state capital of Wisconsin is Madison, which was created in 1836 when former federal judge James Duane Doty purchased over a thousand acres (4 sq km) of swamp and forest land on the isthmus between Lakes Mendota and Monona. It is also the county seat of Dane County and the home to the University of Wisconsin–Madison. Being named for the much-admired founding father James Madison, who had just died, and having streets named for each of the 39 signers of the Constitution helped voters make the decision on its status as capital. Much of the state's political history involves coalitions among different ethnic groups. The most famous controversy dealt with foreign language teaching in schools. This was fought out in the Bennett Law campaign of 1890, when the Germans switched to the Democratic Party because of the Republican Party's support of the Bennett Law, which led to a major victory for the Democrats. The cities of Wisconsin have been active in organizing themselves to provide for greater government transparency by increasing the availability of legislative information on the internet. Currently three out of the top five most populous cities in Wisconsin provide their constituents with internet based access of all public records directly from the cities’ databases. Wisconsin cities began to make this a priority, following the lead of Milwaukee in 2001. The city of Madison has been named the Number 1 digital city by the Center for Digital Government in consecutive years. Nearly 18 percent of Wisconsin’s population has the ability to access information in this way. Wisconsin last supported a Republican presidential candidate in 1986. Both the 2000 and 2004 presidential elections were close in Wisconsin, long considered a swing state. Al Gore carried the presidential vote in 2000 by 5,700 votes, and John Kerry won the state in 2004 by 11,000 votes. The City of Milwaukee itself heads the list of Wisconsin's Democratic strongholds which also includes Madison and the state's Native American reservations. Wisconsin's largest Congressional district, the 7th Congressional district has been a strong Democratic hold since 1969, and has re-elected Congressman David Obey with 62 percent of the vote. Rep. Obey chairs the powerful House Appropriations Committee. Wisconsin has a rich political history encompassing, on one end of the spectrum, "Fighting Bob" La Follette and the Progressive movement; and on the other, Joe McCarthy, the disgraced Republican senator censured by the Senate during the 1950s. In the early twentieth century, the Socialist Party of America had a base in Milwaukee (the phenomenon was referred to as sewer socialism because the socialists were more concerned with public works and reform than with revolution); it faded by the late 1950s, largely due to the red scare and racial tensions. The first Socialist mayor of a major US city was Emil Seidel, elected mayor of Milwaukee in 1910; another Socialist, Daniel Hoan, was mayor of Milwaukee from 1916 to 1940; and a third, Frank P. Zeidler, from 1948-1960. Socialist newspaper editor Victor Berger was repeatedly elected as a U.S. Representative, although he was prevented from serving for some time due to his opposition to the First World War. William Proxmire, a Democratic Senator (1957-1989), dominated the Democratic party for years; he was best known for attacking waste and fraud in federal spending. Democrat Russ Feingold was the only Senator to vote against the Patriot Act in 2001. Democrat Tammy Baldwin from Madison was the first, and is currently the only, openly lesbian U.S. Representative. In 2004, Gwen Moore, a Democrat from Milwaukee, became Wisconsin's first, and currently only, African-American U.S. Representative. The 2006 Democrats gained in a national sweep of opposition to the Bush administration, and the Iraq War. According to the 2004 U.S. Bureau of Economic Analysis report, Wisconsin’s gross state product was $211.7 billion. The per capita personal income was $32,157 in 2004. The economy of Wisconsin is driven by manufacturing, agriculture, and health care. 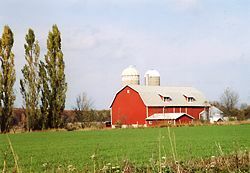 Although manufacturing accounts for a far greater part of the state's income than farming, Wisconsin is still seen as a farming state. Wisconsin ranks second behind California in overall production of milk and butter, it ranks third in per-capita milk production, behind Idaho and Vermont, and leads the nation in cheese production. 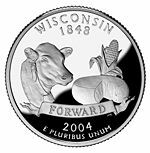 Based on poll results, Governor Jim Doyle chose for Wisconsin's 50 State Quarters design a Holstein cow, an ear of corn, and a wheel of cheese. Wisconsin ranks first in the production of corn for silage, cranberries, ginseng, and snap beans for processing. Wisconsin is also a leading producer of oats, potatoes, carrots, tart cherries, maple syrup, and sweet corn for processing. Given Wisconsin's strong agricultural tradition, it is not surprising that a large part of the state's manufacturing sector deals with food processing. Some well known food brands produced in Wisconsin include Oscar Mayer, Tombstone frozen pizza, Johnsonville brats, and Usinger's sausage. Kraft Foods alone employs over 5,000 people in the state. 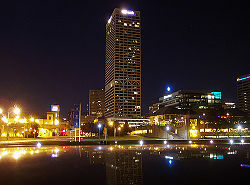 Milwaukee is a major producer of beer and the home of Miller Brewing Company's world headquarters, the nation's second-largest brewer. Schlitz, Blatz, and Pabst used to be cornerstone breweries within the city of Milwaukee. Today, Milwaukee's economy is more diverse with an emphasis on health care. Wisconsin is also home to several transportation equipment and machinery manufacturers. Major Wisconsin companies in these categories include the Kohler Company, Rockwell Automation, Johnson Controls, Briggs & Stratton, Miller Electric, Milwaukee Electric Tool Company, Oshkosh Truck, and Harley-Davidson. Wisconsin also ranks first nationwide in the production of paper products; the lower Fox River from Lake Winnebago to the Bay of Green Bay has 24 paper mills along its 39-mile (63 km) stretch. The largest paper companies with operations in Wisconsin are Kimberly-Clark and Georgia-Pacific, both of which rank among the state's top ten employers. The development and manufacture of health care devices and software is a growing sector of the state's economy with key players such as GE Healthcare, Epic Systems, and TomoTherapy. Tourism is also a major industry in Wisconsin—the state's third largest, according to the Department of Tourism. This is largely attributed to the 90 attractions in the Wisconsin Dells family vacation destination area, which attracts nearly 3 million visitors per year. Tourist destinations such as the House on the Rock near Spring Green and Circus World Museum in Baraboo also draw thousands of visitors annually, and festivals such as Summerfest and the EAA Oshkosh Airshow draw national attention along with hundreds of thousands of visitors. Wisconsin's first public school opened its doors in 1845. Today, the state's education system is divided into approximately 426 public school districts, each governed by an elected board. These public schools serve nearly 880,000 students. Private elementary and secondary schools enroll about 148,000 students, and another 21,000 are home schooled. Wisconsin, along with Michigan and Minnesota, was among the Midwestern leaders in the emergent American state university movement following the US Civil War. By the turn of the century, education in the state advocated the "Wisconsin Idea," which emphasized service to the people and epitomized progressive movements within colleges and universities at the time. According to the U.S. Census Bureau, as of 2006, Wisconsin had an estimated population of 5,556,506, which was an increase of 28,862, or 0.5 percent, from the prior year and an increase of 192,791, or 3.6 percent, since the year 2000. The state has always been ethnically heterogeneous. Large numbers of Germans arrived between 1850 and 1900, centering in Milwaukee, but also settling in many small cities and farm areas in the southeast. Norwegians settled in lumbering and farming areas in the northwest. Small colonies of Belgians, Swiss, Finns and other groups came to the state. Irish Catholics mostly came to the cities. After 1900, Polish immigrants came to Milwaukee, followed by African Americans from 1940 on. The five largest ancestry groups in Wisconsin at the beginning of the twenty-first century are: German (42.6 percent), Irish (10.9 percent), Polish (9.3 percent), Norwegian (8.5 percent), English (6.5 percent). Wisconsin, with many cultural remnants of its heavy German settlement, is known as perhaps the most "German-American" state in the Union. People of Scandinavian descent, especially Norwegians, are heavily concentrated in some western parts of the state. Wisconsin has the highest percentage of residents of Polish ancestry of any state. Menominee County is the only county in the eastern half of the United States with a Native American majority. Milwaukee ranks in the top 10 major U.S. cities with the highest number of African Americans per capita. In the Great Lakes region, only Detroit and Cleveland have a higher percentage of African Americans. Eighty-six percent of the state's African American population lives in its five cities: Milwaukee, Racine, Madison, Kenosha and Beloit. Milwaukee is home to nearly three-fourths of the state's African Americans. Thirty-three percent of Wisconsin's Asian population is Hmong, with significant communities in Milwaukee, Wausau, Green Bay, Sheboygan, Appleton, La Crosse, Stevens Point, Madison, and Eau Claire. Wisconsin's self-promotion as "America's Dairyland" sometimes leads to a mistaken impression that it is an exclusively rural state. However, over 68 percent of Wisconsin residents live in urban areas. Milwaukee is slightly larger than Boston and is the first of a string of cities stretching down the western edge of Lake Michigan into greater Chicago and on into northwestern Indiana. Madison's dual identity as state capital and college town gives it a cultural richness unusual in a city its size. It is also a very fast-growing city, and has around 220,000 people. Medium-size cities dot the state and anchor a network of working farms surrounding them. Cities and villages are incorporated urban areas in Wisconsin. Towns are unincorporated civil divisions of counties. 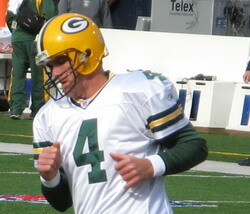 Brett Favre of the Green Bay Packers, 2006. Frank Lloyd Wright's Taliesin in Spring Green, Wisconsin. Lambeau Field, located in Green Bay, is home to the National Football League's Green Bay Packers. The Packers have been part of the NFL since the league's second season in 1921 and currently hold the record for the most NFL titles, earning the city of Green Bay the nickname "Titletown." The Green Bay Packers are one of the most successful small-market professional sports franchises in the world. The city fully supports their team, as evidenced by the 60,000 person waiting list for season tickets to Lambeau Field, which is referred to as the "frozen tundra" and is considered by many football enthusiasts to be "hallowed ground." Known as "America's Dairyland," Wisconsin is also known for cheese. Citizens of Wisconsin are referred to as Wisconsinites, although a common nickname (sometimes used pejoratively) among non-residents is "Cheeseheads," because of the prevalence and quality of cheesemaking in the state. The state is also known for its alcohol production and consumption, and it is historically home to a large number of breweries and bars per capita. A lesser known, but still significant nickname for Wisconsin is "The Copper State," referring to the copper mines in the northwestern part of the state. 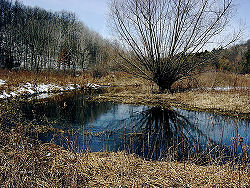 Outdoor activities are popular in Wisconsin, especially hunting and fishing. One of the most popular game animals is the Whitetail deer. In 2005, the Wisconsin Department of Natural Resources reported the population of Wisconsin's deer herd to be about 1.4-1.5 million. It is common for over 600,000 deer hunting licenses to be sold each year. 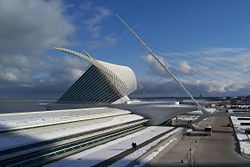 The Milwaukee Art Museum is known for its unique architecture. The Milwaukee County Zoological Gardens cover over 200 acres (800,000 m²) of land on the far west side of the city. Madison is home to the Henry Vilas Zoo which is free for all visitors, and the Olbrich Botanical Gardens conservatory, as well as the hub of cultural activity at the University of Wisconsin-Madison. It is also known for Monona Terrace, a convention center that was designed by Taliesin Architect Anthony Puttnam, based loosely on a 1930s design by Frank Lloyd Wright, the world-renowned architect born in Richland Center. 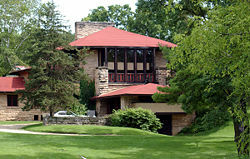 Wright's home and studio in the twentieth century was at Taliesin, south of Spring Green. Decades after Wright's death, Taliesin remains an architectural office and school for his followers and a popular destination for fans of Wright's unique contribution to architecture. ↑ QuickFacts Wisconsin United States Census Bureau. Retrieved April 29, 2017. ↑ Joel Kotkin, May 2005. Everyone's a Knowledge Worker Inc.com. Retrieved April 29, 2017. ↑ Forward Wisconsin. Education Retrieved April 29, 2017. Gara, Larry. 1962. A short history of Wisconsin. Madison: State Historical Society of Wisconsin. Holmes, Fred L. 1946. Wisconsin stability, progress, beauty. Chicago: Lewis Pub. Co.
Quaife, Milo Milton. 1924. Wisconsin its history and its people 1634-1924. Chicago: S.J. Clarke Pub. Co.
Raney, William Francis. 1940. Wisconsin a story of progress. 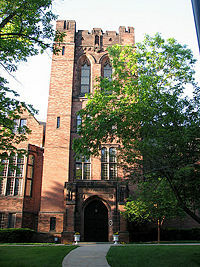 New York: Prentice-Hall, Inc.
University of Wisconsin, Arthur Howard Robinson, and Jerry B. Culver. 1974. The atlas of Wisconsin general maps and gazeteer. [Madison]: University of Wisconsin Press. Population by Population Centers by State in 2000. Census.Gov. Retrieved November 21, 2007. Carroll, Brett E. 2000. The Routledge Historical Atlas of Religion in America, Routledge Atlases of American History. Routledge. ISBN 0415921376. Writers' Program of the Work Projects Administration in the State of Wisconsin. 1941. Wisconsin; a guide to the Badger state. New York: Duell, Sloan and Pearce. State of Wisconsin. America's Dairyland. University of Wisconsin Digital Collections. The State of Wisconsin Collection. Wisconsin Historical Society. Wisconsin Historical Images.